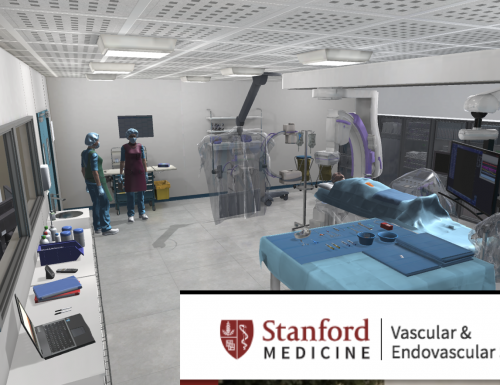 New clinical case with Stanford, a vascular medicine clinical case using virtual reality. On April 22nd and 23rd, SimforHealth, was held among hundreds of companies of several countries of the world, to present its international platform MedicActiV, dedicated to the creation, the consultation and the distribution of virtual clinical cases, during the “Stanford Ed Conference“, a conference on the future of medical education at the intersections of people, technology and design. During its pitch, SimforHealth exposed its first clinical case in virtual reality of vascular medicine, in the category “Embracing New tech opportunities”, with the cooperation of Doctor Aalami, Clinical Associate Professor and Vascular Surgeon, Dr Fougerouse and Dr Goehrs MD – MSc Biomedical Informatics. This case has for main educational objective to learn to use the mini-invasive therapeutic options to handle the aneurysm of the abdominal aorta ( AAA), and to understand the contributions of a guide by ultrasound. Divided into 4 consultations, this simulation of clinical case allows a dumping in a virtual decoration of doctor’s cabinet or in an operating room. Instead of a vascular surgeon, the student or the connected healthcare professional can receive a patient in a virtual consultation. This male patient of 65 years, came on one year before for a small-sized aneurysm (< 5 cms) as an aneurysm of the abdominal aorta. During the virtual clinical case, he will then have to be redirected towards an operation and the learner can realize in virtual reality using the correct device like the HTC Vive.A dumping in the consultation of a doctor and in the operating block, was developed thanks to the platform of MedicActiV, to allow the trainee to practice in the case of an abdominal aneurysm of the aorta and in the preparation before an operation for the installation of a stent. During this conference, the team of SimforHealth also presented the evolution of its new platform MedicActiv with a the major capital gain of, which is the opportunity to have a tool author for virtual clinical cases. For more information, don’t forget to follow us on Twitter. Previous Previous news item The new MedicActiV authoring tool: intuitive and collaborative.